As I've mentioned here once before, video games have been a lifelong hobby of mine. Ever since I first wrapped my fingers around an Atari 2600 joystick, I've been obsessed and engrossed by this digital art form. And through the years, one thing has remained constant in my love affair with gamedom: the games that I love most have always been the ones that tell the best stories. In my opinion, video games are a vastly underappreciated avenue for storytelling. The best game experiences are like interactive movies and novels, thrusting players into the role of the protagonist and tasking them with the resolution of the plot. In some cases, players are even given the opportunity to shape the story themselves via the choices they make along the way. This unique aspect of the medium has given writers who toil on the digital playground the opportunity to craft some truly memorable experiences. 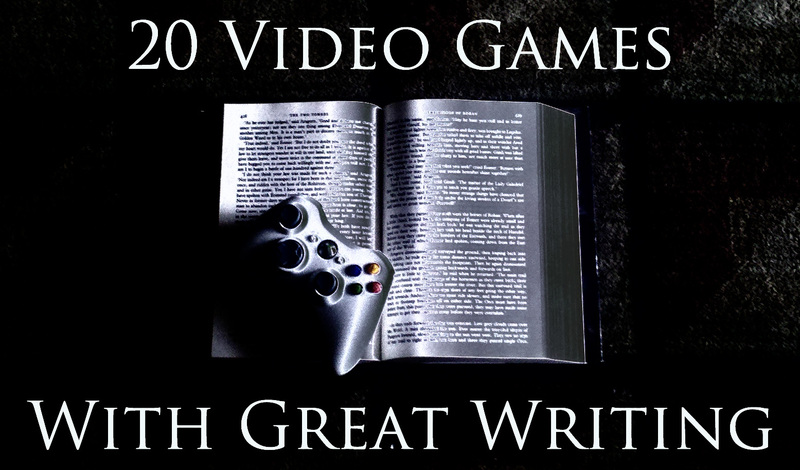 So in this entry and the next, I'm going to be counting down the top twenty games (and game franchises) that I believe exhibit the best examples of great writing in video games. Developed by Troika Games (a now defunct company founded by former members of the team responsible for the first two Fallout games), Bloodlines is a first-person role-playing game set in White Wolf's World of Darkness. While the game flew largely under the radar when it was released in 2004, it has since garnered a respectable cult following, due in no small part to its compelling storyline and unique cast of characters. The player takes on the role of a freshly sired vamp, thrust unwillingly into the feudal politics of the vampire clans. The writing perfectly captures the feel of White Wolf's popular tabletop RPG, delivering a thrilling, moody experience. Based on a popular series of fantasy novels by Polish author Andrzej Sapkowski, The Witcher took gamers by surprise in 2007. Developed by a studio out of Poland called CD Projekt Red, the game follows the protagonist of the books, a witcher (read: monster slayer) by the name of Geralt. It was followed by a well-received sequel in 2011. The series became well known for the taxing choices players are faced with as the plot unravels. CD Projekt Red broke the trend of black and white morality common among RPGs in the current gaming landscape, presenting dilemmas that drift into gray territory and force players to weigh their options carefully. In 2000, the original Deus Ex was released to vast critical acclaim. Developed by Ion Storm, it built on elements pioneered six years earlier in System Shock, creating one of the world's first truly realized RPG/first-person shooter hybrids. Recently, the series has been revived with Deus Ex: Human Revolution, a long awaited sequel that captures the same open-ended gameplay and dystopian-cyberpunk atmosphere of the original. Tackling heavy subjects such as post-humanism, class warfare, and the growing political power of multinational corporations, the deep plot of the Deus Ex series is a conspiracy theorist's dream (or nightmare). Blood Omen: The Legacy of Kain was the first hack n' slash RPG that I ever played, and it blew my socks off. Jointly developed by Silicon Knights and Crystal Dynamics (who later engaged in a lengthy legal battle over the property), it told the story of Kain, a vampire antihero who rises from the grave to reap vengeance on his murderers and find a cure for his curse. The dark fantasy world of Nosgoth would eventually be explored over the course of four more titles (including the Soul Reaver duology), incorporating time travel, alternate dimensions, and Lovecraftian elder gods as Kain's story grew to encompass thousands of years of twisted history. System Shock may be the most influential game on this list. Released by Looking Glass Studios in 1994, it pioneered gameplay elements never before seen and featured a level of storytelling then unheard of in action games. Games like Deus Ex and BioShock have been called spiritual successors to System Shock by their creators. Players take the role of a hacker who agrees to unshackle the ethical constraints of a space station's AI in exchange for neural implants and legal clemency after being apprehended. After awakening from a six-month healing coma to find the AI in control of the station and most of its occupants dead, he sets out to correct his mistake. For years, when someone asked me what my favorite game was, the answer was Metal Gear Solid. It's since been eclipsed by another game on this list, but the series remains in the upper echelon of gaming history. Released by Konami in 1998, Metal Gear Solid was the first game that felt like you were playing an interactive movie. Players usually take control of Snake, an elite espionage agent favoring stealth over direct confrontation. With a narrative spanning from the Cold War to the near future, the series has touched on themes of war, international intrigue, nuclear proliferation, and information control. Few video game stories have left me as riveted as this one. Though it began life as an unofficial sequel to Wasteland, the Fallout series has long since eclipsed its spiritual ancestor to become one of the most popular RPG franchises in the industry, and with good reason. The Fallout games take place in an alternate history in which the transistor is never invented, atomic physics become the center of modern technology, and a fiery nuclear apocalypse engulfs the world in 2077. The player is usually a denizen of one of the many "vaults" that protect some lucky survivors from annihilation, and is eventually forced to leave this shelter and explore the deadly post-apocalyptic wasteland. The old school, point-and-click adventure genre has long been one of the premier avenues for great storytelling in video games, and Broken Sword is no exception. While most adventure games of the time focused on humor, in 1996 Revolution Software presented a story that took itself seriously in Broken Sword: Shadow of the Templars. When American George Stobbart becomes the accidental witness of a terrorist attack while on vacation in Paris, he soon finds himself wrapped up in an international conspiracy with the famed Knights Templar at its heart. The action, romance, and intrigue of the Broken Sword games would make Indiana Jones envious. Speaking of great writing and adventure games, Grim Fandango is without a doubt right at home on this list. One of the last bastions of the genre before a long dearth that we are only now beginning to recover from, this 1998 classic from Lucasarts has just about everything I love about adventure games. The game's story revolves around Manny, a travel agent in the Department of Death who is tasked with guiding the recently deceased through the land of the dead. Featuring a cast of memorable characters, a refreshingly original story, and several laugh-out-loud moments, Grim Fandango is long overdue for digital rerelease. In 1998, Valve revolutionized the first-person shooter genre with the release of the first Half-Life, bringing immersive storytelling to a new level and influencing scores of games that followed in its footsteps. Then in 2004, they upped the ante even further with Half-Life 2, a sequel of epic proportions. Half-Life casts the player into the powered hazard suit of Dr. Gordon Freeman, a theoretical physicist engaged in a dangerous experiment at the Black Mesa Research Facility. When the experiment goes horribly wrong (natch), Freeman finds himself inadvertently responsible for an interdimensional alien invasion. And so concludes part one of the countdown! Swing your eyeballs back around next Monday right here for the exciting conclusion. In the mean time, feel free to let me know what you think of the games on this list (or about the state of writing in video games in general), but don't complain at me about your favorites not making the cut until you've seen the remaining top ten. And if you're a gamer and you haven't played these gems yet, grab the ones you can manage to get your hands on and report back for debriefing. Fallout and Half-life - definitely! They are also underappreciated for the amount of work that goes into the graphics and details. And I've been a fan since I first held a Pong paddle. Scary, huh? I must admit, I never had the chance to hold a genuine pong paddle. I've played it on just about every other console, though! Fallout and Half-Life are two perfect examples of why this list was agonizing to write. It seems almost a travesty to rank them so low on any video game list, but the fact is there is a LOT of great writing in the games industry. Love those games! Thanks for stopping by, Alex. It is interesting that you have Half-Life 2 in the list, only because the original Half-Life also had great writing, it was just tucked away in the little details like the conversations between the scientist or the chatter of the soldiers. The designers create a great sense of atmosphere and let it speak for itself. I agree! If you notice, even though the video in the post is of Half-Life 2, I actually listed the entire Half-Life series in the number eleven spot. As great as HL2 and the sequel episodes were, the first game is the one that changed the way developers approach storytelling in first-person shooters. If Planescape Torment isn't on the next part of the list, I'd be shocked. I have my own personal guilty pleasure favorite game franchise which would never make your awesome list, but Devil May Cry has my heart. It just does. :) Can't wait to see the rest of your list. Metal Gear Solid has always enthralled me, and I can't wait to see where the series goes in the future. It's easily one of the best overall game series in the history of the planet. I admit, I struggled a bit when it came to placing MGS on this list and I tried to be as unbiased as possible (since there are many reasons to love a game besides its writing). While the overall storyline of MGS is certainly one of the most compelling, what ultimately held it back on this list was the dialog. It pains me to admit it, and it might be a localization issue, but a lot of the dialog in the series is just plain bad. That's the one major flaw in MGS's writing, but it was a big enough one to keep it out of the top ten for me. I haven't played any of the games listed - but growing up with brothers and having a husband seeking to break into the industry - I recognized most of the titles. Just wanted to let you know, I read them out loud to Wombat (my husband)and he nodded to every one of them. Good call - look forward to seeing the rest. Ha ha, good to hear! Glad I got some nods of agreement from Wombat. Thanks, Randi! I think I'm about due for a replay of Grim Fandango. It's been a long time. Can't wait for Double Fine's new adventure game. Most everything Tim Schaffer writes is fantastic. Deux Ex was a mind-mending story. One of the best uses of nanotech in games. Great list J.W.